IFI Research Project GameSurvey has been supported with a subsequent funding round by Internet Fundation Austria as part of the 10th Call of Netidee. 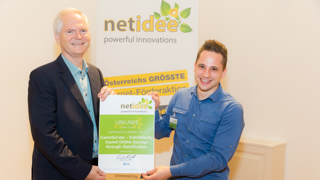 Netidee is Austria’s largest internet funding program by Internet Foundation Austria. Among 26 other projects selected by the jury, GameSurvey has again been supported. This year’s funding pool represents a total of 1 Million Euros, allocated to various projects and scholarships. GameSurvey was first funded in 2013. A subsequent funding is only granted for projects that not only met prior funding criteria, but also show great potential for the future and include additional developments. We would like to thank Netidee for their support, that allowed for a complete new development of the software.